[NOV. 10, 2001] Family Reading Night at the Lincoln Public Library is Thursday evening, Nov. 15, at 6:30 p.m. Singer, musician, songwriter, storyteller and author Mike Anderson will be performing. Anderson’s programs are entertaining for people of all ages, and he is an award-winning teacher. He received a National Children’s Television Award for "Mike’s Music Works," a television show that he wrote and hosted. His latest storytelling recording, a collection or original writing entitled "The Great Sled Race," won a Parents’ Choice 2000 Silver Honor. He has written a new children’s book entitled "The Phantom Teacher." The library is located at 725 Pekin St. For more information about this program and future children’s programs, call the library at 732-8878 or 732-5732. [NOV. 7, 2001] “Following Fake Man," by Barbara Ware Holmes. Alfred A. Knopf, 2001, 228 pages. "This kid was nursed on a pickle," Madeleine liked to tell anyone who would listen. Meaning me, of course, Homer Winthrop. "Nursed on a pickle and weaned on prune juice." This is our introduction to the main character of this book as the housekeeper, Madeleine, is describing him. Homer enjoys not talking and sulking as a way to get back at a mother he feels has closed him out of her life. Homer’s father was a neurologist who died of a neurological disease when Homer was 2 years old. That is almost all he knows about his father because his mother refuses or is unable to talk about him. The Winthrops live in Boston but are on their way to Maine for summer vacation, which in itself is a mystery to Homer because his mother doesn’t take vacations. He has a feeling that this is more than a vacation when his mother announces that the house they will be staying in is their house. This knowledge really surprises Homer, and he decides to talk because he wants to know all about the house. He realizes that his father would have been there at one time, and he is determined to find the truth about his father’s death. His mother tells him as little as she can, and the rest of the story he must find out for himself. Homer goes exploring on his first morning in Maine and meets a boy named Roger, who introduces Homer to the mystery of the costumed man. Roger has discovered that even though the man appears to be old and gray, it is really a disguise. Homer and the mysterious man are soon linked when his mother reacts drastically to seeing him on the street. He is sure that this man is a part of the answers he needs about his father. The boys soon become fast friends with the common goal of exposing "Fake Man." Shortly after seeing Fake Man, Homer’s mother announces that he is not to make any connections while they are there and takes to her bed with one of her frequent migraines. This makes Homer more determined than ever to find out the truth. There is something about being where he has history that gives him a courage he has never experienced before. His mother’s illness also makes it easier for the boys to carry out their plan of following Fake Man. This leads them to a cabin in the woods at the edge of town, where even more secrets are exposed. Homer eventually follows Fake Man to Owl Island. 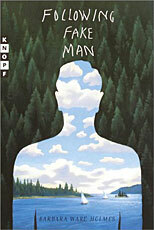 The man turns out to be a famous artist who disguises himself so he can paint in peace. He was also Homer’s father’s best friend. He tells Homer about his father and other much-needed information about his past. They confront Homer’s mother with the information, and it seems as if the Winthrops will be able to start the healing process and have a future together as a family. This is a humorous yet poignant story about friendship and family. It is recommended for grades five through seven. Barbara Ware Holmes has written several other books for children, including "Letters to Julia" and "My Sister the Sausage Roll." For more information, visit the library at 725 Pekin St. or call (217) 732-8878 or 732-5732. [NOV. 12, 2001] Lincoln College Theatre Department opens its second production of the season, "12 Angry Jurors," on Thursday, Nov. 15, at the Johnston Center for Performing Arts. The drama "12 Angry Jurors" was written by Reginald Rose. It is a story told against the backdrop of a murder trial in which a young man has been accused of killing his father. The 12 jurors who have heard the testimony and seen the evidence must decide the fate of the young man. In the initial vote, one juror stands alone with a vote of not guilty. What unfolds is a story of people facing their own past, their convictions about illusion and truth, and ultimately discovering the truth about themselves. Guest director Tom Quinn feels this play will help people to explore and understand prejudice, stereotyping and the concept of reasonable doubt. "This play was first presented on television in the late ’50s, and the subject matter and theme in this production remains as important and insightful as it was then," he says. Cast members include Jemel Washington of Decatur as the Guard, Rachel Brancecum of Canton as the Foreman, Chad Pedigo of Springfield as Juror 2, Ashley Lyons of Waverly as Juror 3, Michael Heath of Annawan as Juror 4, Ben Fulks of Rushville as Juror 5, Larry Jones of Hartsburg as Juror 6, Kelly Wiegand of Henry as Juror 7, Nichelle Bringham of Oak Park as Juror 8, Nathan Beagle of Muskegon, Mich., as Juror 9, Annemarie Windhorst of Mahomet) as Juror 10, Jessica Buck of Effingham as Juror 11 and Courtney Cooley of Springfield as Juror 12. Show time is at 8 p.m. Thursday, Nov. 15; Friday, Nov. 16; and Saturday, Nov. 17; with a matinee performance at 2 p.m. Sunday, Nov. 18. Ticket prices are $5 for adults, $3 for children and senior citizens. To reserve tickets, call (217) 732-3155, Ext. 280, Monday through Friday, 8 a.m. to 5 p.m.
Lincoln Community Theatre’s website serves a number of functions, from providing information on becoming a season ticket holder to showing what new productions are being planned. Pictures from past productions are also posted. Visit LCT’s website at www.geocities.com/lincolncommunitytheatre/index.html, e-mail LCT at lincolncommunitytheatre@yahoo.com, or write to Lincoln Community Theatre, P.O. Box 374, Lincoln, IL 62656.